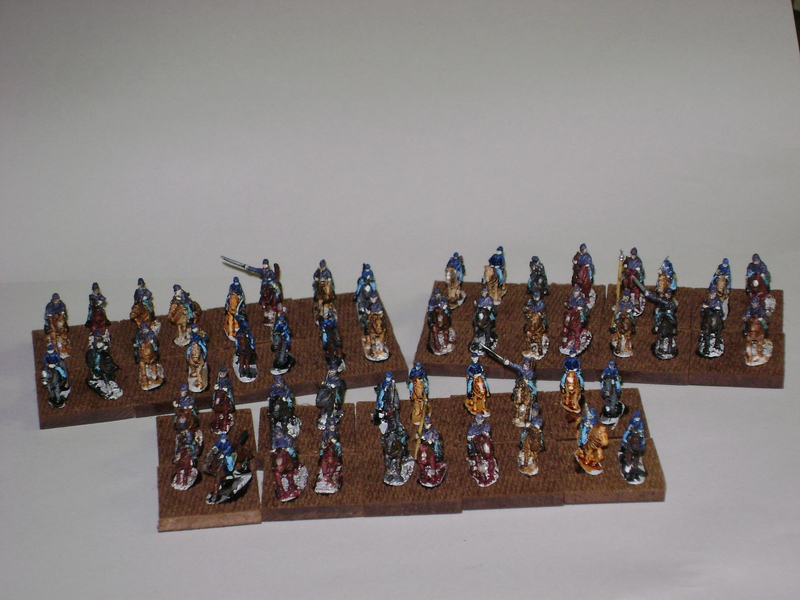 Sword and Spear | Glory Eagles de l'Empereur! [Forged in Battle] War and Empire II Kickstarter has begun. Just a quick post to let people know that the second Forged in Battle 15mm Ancients kickstarter has started. I really like the figures I got from the first one they did (reviewed here) so I made sure to jump into this one as soon as it started. The first was Peloponnesian War, Punic Wars, Successors and Early Romans, this one covers the Legions of Rome, with figures available for Augustan Romans, 1st and 2nd C Romans, Dacians, Picts, Sassanids, Maccabeans, Early Franks, and Early Saxons, and I’m hoping for 3rd C Romans too (Andy hinted they would be available in the pre-kickstarter promo page), which would be perfect what with the incoming Aurelian game from Sam Mustafa. So, if you’re in the market for some very nicely sculpted Roman legionaries and their assorted enemies, go and look at the kickstarter. Highly recommended. Just a quick update to put up some pics of stuff I’ve been working on recently. Well, sort of recently. I did the artillery and cavalry a good few months back now, but only got around to gluing them to their bases this weekend. 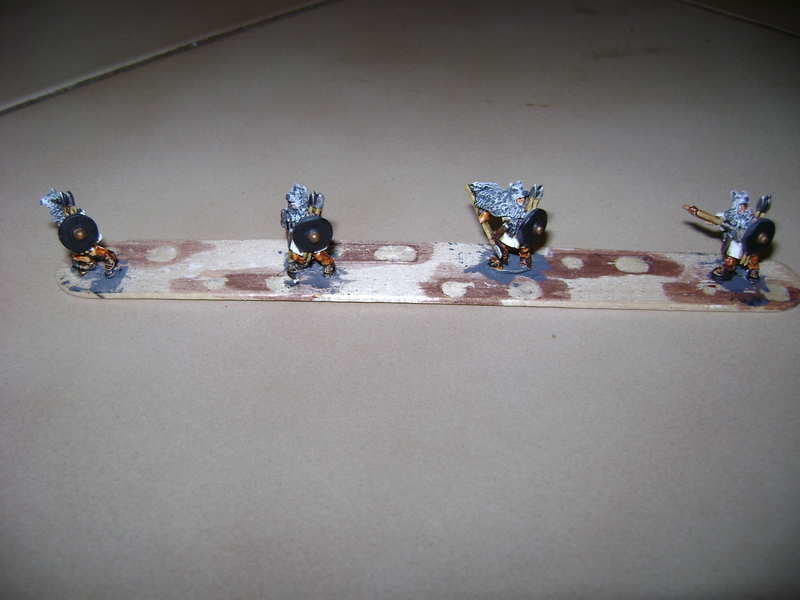 All of these are glued onto bases but otherwise unbased; as usual, I’m waiting until I have them all painted up and glued to bases before I do that, so that they’ll all be uniformly based. 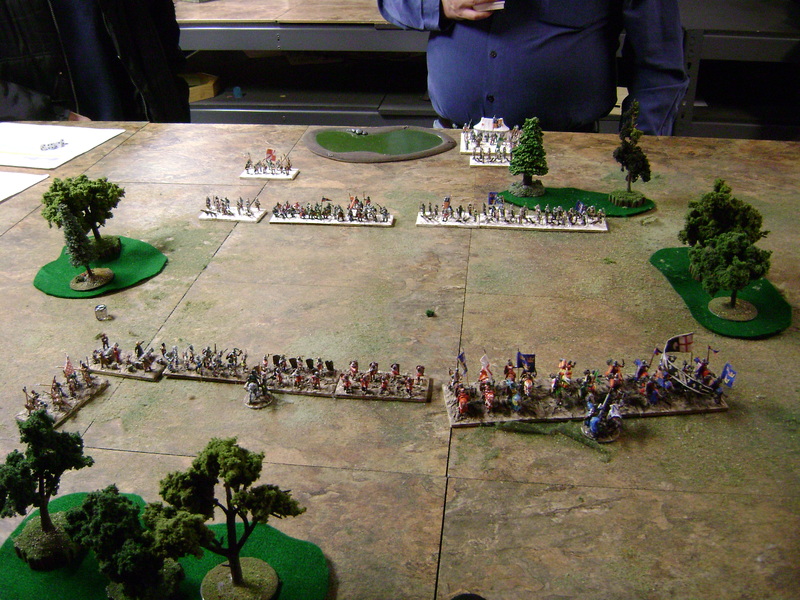 So, here to start are some Union cavalry for Longstreet. 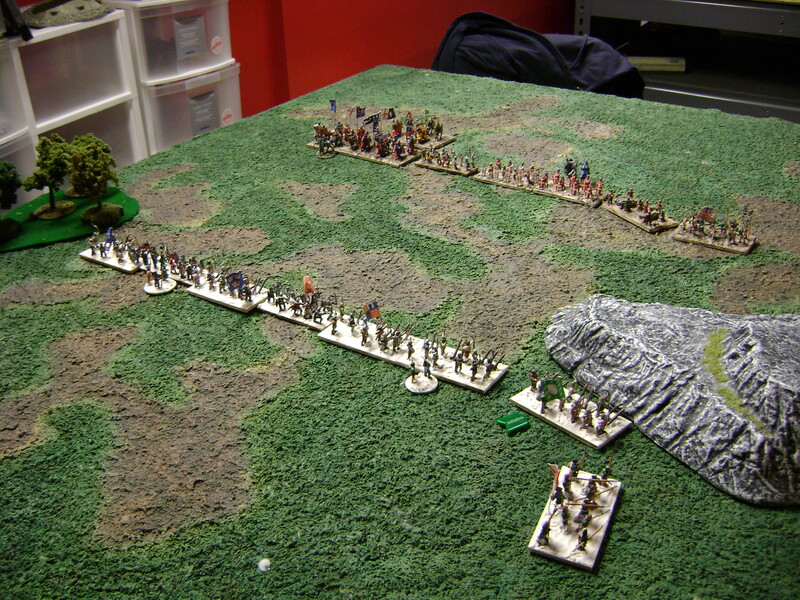 The figures are a mix of Cracker Line, Plank Road (the old Starfort line) and Pendraken. 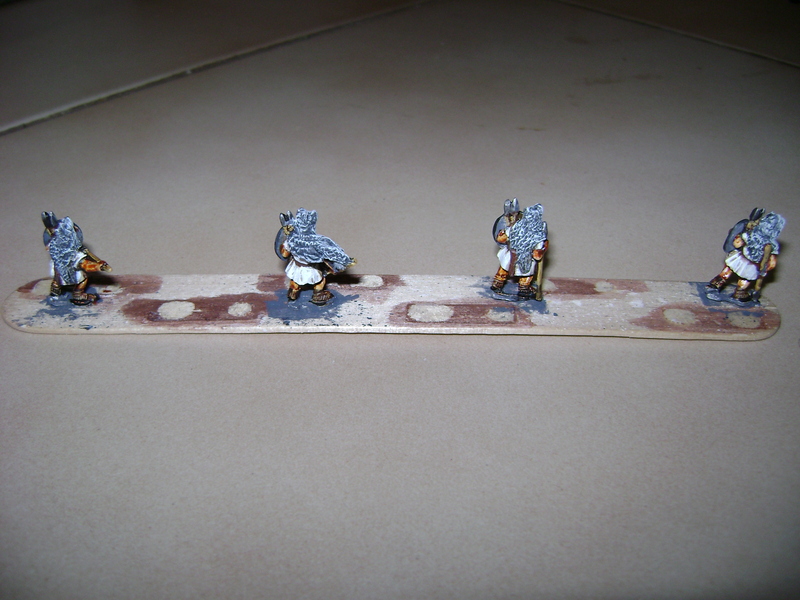 They fit fairly well – the Plank Road horses are distinctly smaller than the Pendraken ones, and the Cracker Line ones are roughly in the middle between the other two lines, but I mixed them up anyway. [Sword and Spear] Photomontage time! Starting positions. I’m the English at the bottom, David was the French at the top. I backed the War and Empire kickstarter campaign by Forged in Battle a while ago, which was very successful, and ended up with quite a lot of figures as a result which arrived a month or two ago. Since the figures are now about to appear on the open market, I thought I’d do a quick review of them. I’ll add pics here and there throughout this post of the figures, starting with the ones I’ve painted so far (still on their painting sticks). Had another bash against Dan’s Mongols with my HYW English last week. Dan was looking for revenge after our initial outing, when he was soundly defeated. 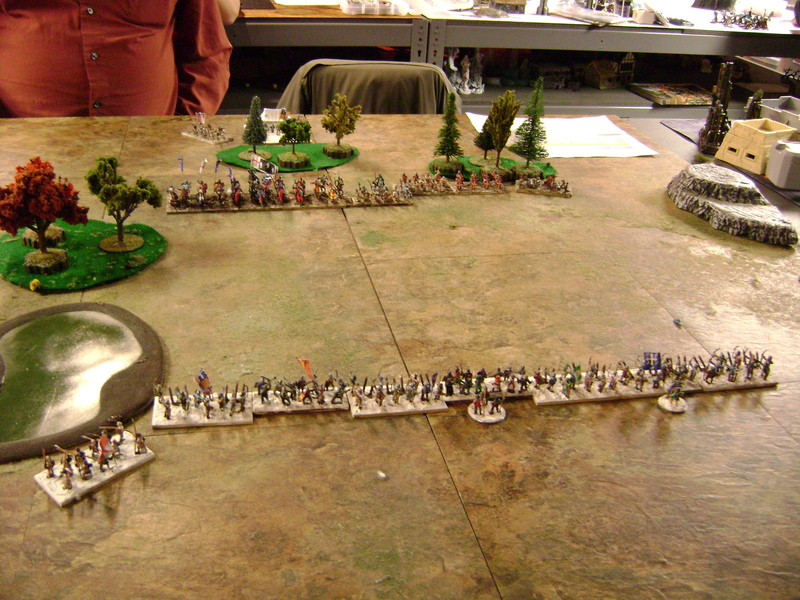 This time he came a little closer, but the result was inevitable – an army comprised of mostly Light Cavalry doesn’t fare too well against a mass of longbowmen and heavy foot unless he can get around the flanks, which he finally did, but too late to make a difference. We diced of terrain as normal, and that’s where I had my first stroke of luck – obviously Dan didn’t want much terrain to get in the way, but I managed to pick 5 pieces, and my first roll enabled me to place to wherever I wanted. Then Dan rolled, and even better, I got to place that piece where I wanted too, so I ended up with two hills forming a pass to defend. 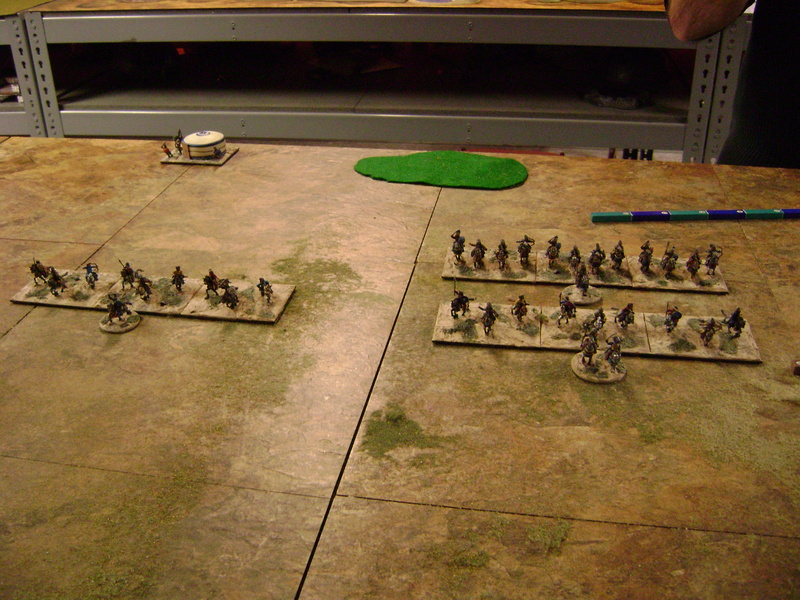 A few more rolls and I ended up with woods forming flanks to those hills too – a nice position to defend.